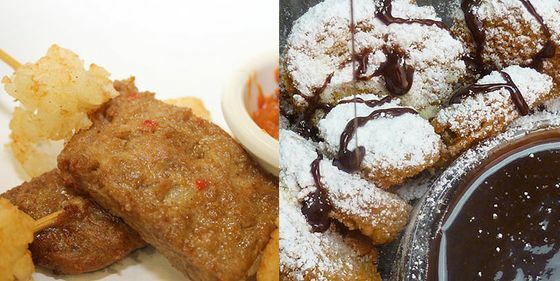 Even as more stringent precincts call for healthier food across the country, America’s state fairs remain a safe haven for freak-flag corn dogs, funnel cakes, and self-expression through creative deep-frying. 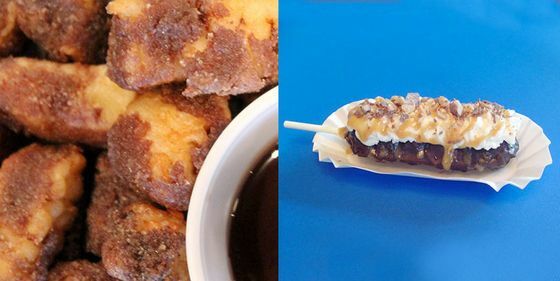 Here’s how we know that tradition isn’t going anywhere: The Minnesota State Fair — which claims to have the largest daily attendance of any state fair in the country — just announced the new foods that will be available in 2013, and they do not disappoint. 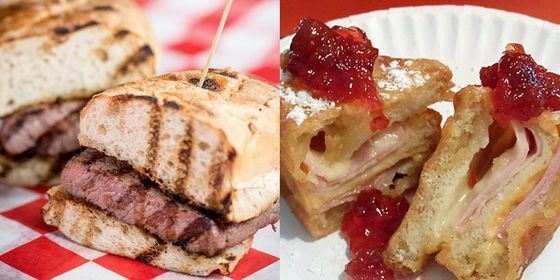 The fair itself doesn’t kick off until next month, but in the spirit of the Fourth of July, now seems like the right time for Grub to share a preview of this amazing celebration of indulgence. Dwellers of Earth, say hello to Comet Corn, described as a “futuristic caramel corn made with liquid nitrogen.” Sub-zero temps mean one breathes vapor trails of “comet dust” that leave a “tingly, bubbly feeling.” The prophecies were true. A griddled and chopped Kramarczuk all-beef wiener chopped into pieces and stuffed into a Pullman bread pocket so large you could probably turn it upside down, shake out the loose change, then crawl inside and take a nap. 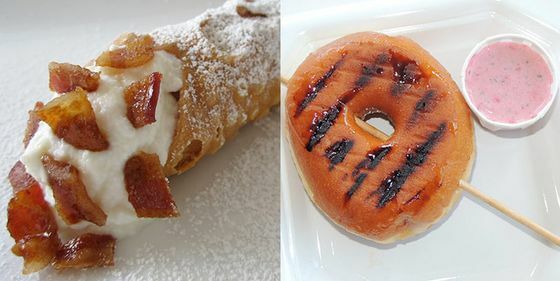 Of course there’s a bacon cannoli. And it’s a class act, too. With strawberry-mint dipping sauce — how seasonal. Seriously, why don’t more people grill glazed doughnuts? 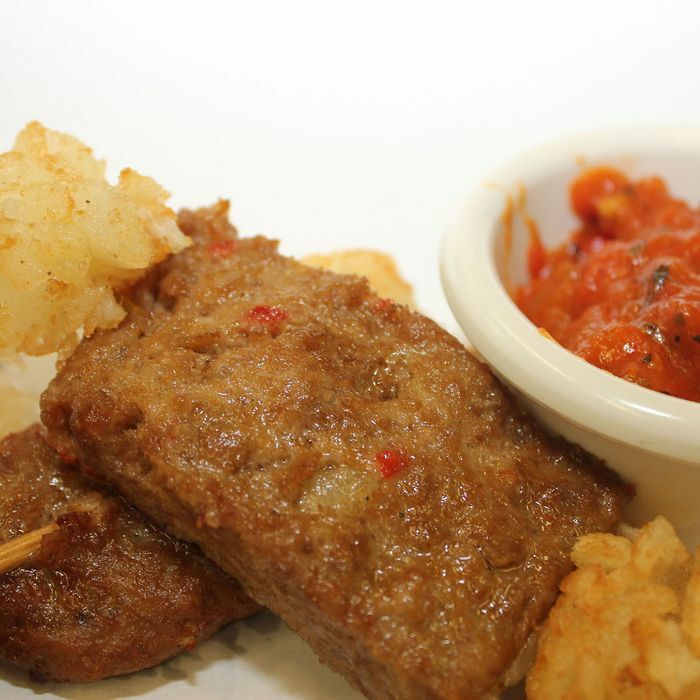 “Where were you when you first found out that someone realized they could batter meatloaf, fry it on a stick, and serve it with a red-pepper-and-Minnesota-wine glaze?” Someday, maybe, your children will ask you this question. It took a briny nine years for legendary Minnesota State Fair vendor the Perfect Pickle to sell its millionth fried chip. 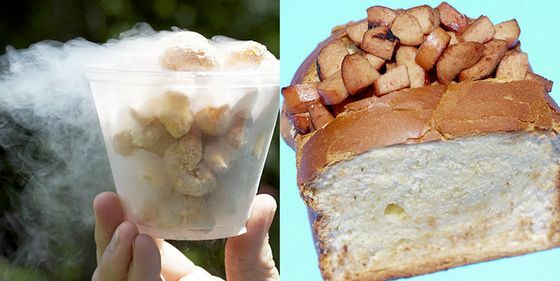 That was a few years ago, and now the masters of innovation return with a new batch that is not only dusted with powdered sugar but served with a mini-sauna of hot chocolate for dipping. Perennial vendor Axel’s ups the ante with crushed cocoa-puff-breaded Wisconsin cheddar cheese nuggets. These nuggets, too, shall be dunked in hot chocolate sauce. Mancini’s al fresco steak sandwich seems like a regular steak sandwich, but consider the fact that every last bit of its surface area has grill marks on it and you realize how dedicated these people are. The sandwich is traditionally pan-fried, sure, but why not prove your love by going all the way with one that’s taken a hot oil bath, been given a fine dusting of powdered sugar, then be-dolloped with raspberry jam. Don’t be a chicken. You get a quarter-pound hamburger and Philly steak, onions, peppers, and a mix of melted American and Swiss. It’s really the best of both worlds. The batter is pancake, the sausage is link. The sauce is maple-flavored. That is all. Don’t be fooled by the sliced orange. Or the presence of walnuts, Craisins, and apples. And chicken salad. This is a fajita. 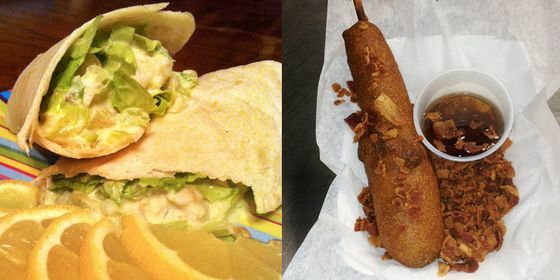 Honorable mentions: The Idaho taco, a Tex-Mex showstopper that replaces the tortilla with a russet potato; Philly fries, where the bread found on a cheesecake sandwich has given way to waffle fries; Cajun pork rinds served with Alabama-White barbecue sauce; fried bread pudding; fried olives; and much, much more. 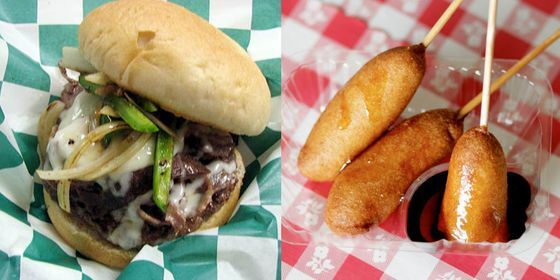 The Minnesota State Fair, with all its neon, beaming llamas, jumbo butter art, well-groomed goats, and freak doughnuts, starts August 22 and goes through Labor Day.